Twitter is one of the top Social Networks that stands next to Facebook. Twitter started to provide "Verified Accounts" in June 2008. The need of verified accounts gradually increased later with minimized parody accounts. People realized they cannot do any further parody without accepting the fact. 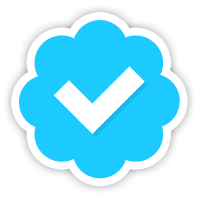 Any account with a blue verified badge is said to be a verified Twitter Account. Twitter verifies accounts on an ongoing basis to make it easier for users to find who they’re looking for. They mainly concentrate on highly sought users in music, acting, fashion, government, politics, religion, journalism, media, advertising, business, and other key interest areas. Twitter do not allow general user's verification requests. If you fall under one of the above categories and your Twitter account meets our qualifications for verification, they may reach out to you in the future. Twitter is constantly checking your accounts all over and they will contact you about getting your account verified. Another way to get verified is that if you run an official website, you can link your twitter account with your website with twitter APIs. Verified Accounts are provided by them legitimately. If the verified badge appears in any other position other than near to the user's profile page, then it is not a verified account.